Today marks the 16-year anniversary of 9/11, and as we remember those who perished and honor first responders on that day, it’s worth noting that we have not had a large-scale terrorist attack on U.S. soil since then. They conclude that underwriters need to think about how terrorists will behave going forward and how governments around the world will counteract terrorism in order to predict where and to what extent future losses may occur. Willis Towers Watson offers insight into how insurers are responding to meet the evolving nature of terrorism. The I.I.I. has resources on terrorism risk and insurance here. A man drives a car into pedestrians on Westminster Bridge, keeps driving, crashes the car outside the Houses of Parliament, then tries to enter the complex armed with a knife. Four people are dead, including a policeman and the assailant, and at least 40 injured. The investigation into yesterday’s terrorist attack in the heart of London is ongoing, as Westminster bridge reopens and Parliament gets back to work. Small group and “lone wolf” terrorist attacks are seen as indicative of the shifting nature of terrorism, according to experts (here and here). In the U.S. such attacks have yet to meet the $5 million damage certification threshold required to trigger the government-backed terrorism risk insurance program (the Terrorism Risk Insurance Program Reauthorization Act of 2015). Broker Marsh reports that while recent attacks may have resulted in little direct physical damage and losses, they still have the potential for significant business disruption costs and contingency losses, for example if a city is put under curfew, or travelers cancel reservations, travel is disrupted, and business activity levels are diminished. To address these evolving threats, insurers have adapted coverage to consider: active shooter situations; extra expense for evacuating people due to threat; contingent interruption of operations; canceled reservations; loss of attraction. Policies can be structured to include nonphysical damage scenarios such as damage resulting from a cyber event, and nuclear, biological, chemical, and radiological (NBCR) risks. Terrorism preparedness is evolving too as businesses adapt to the changing threat (see active shooter prevention and response steps). The last major terrorist attack in the UK in July 2005 targeted the public transportation system during rush hour and left 52 people dead. Insurance Information Institute facts and statistics on terrorism risk available here. 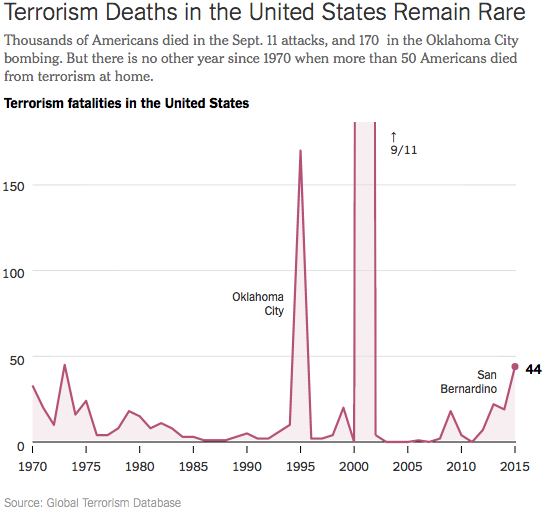 The April 2013 Boston bombing may have marked the first successful terrorist attack on U.S. soil since the September 11, 2001 tragedy, but terrorism on a global scale is increasing. Yesterday’s attack by the Al-Shabaab terror group at a university in Kenya and a recent attack by gunmen targeting foreign tourists at the Bardo museum in Tunisia point to the persistent nature of the terrorist threat. Groups connected with Al Qaeda and the Islamic State committed close to 200 attacks per year between 2007 and 2010, a number that grew by more than 200 percent, to about 600 attacks in 2013, according to the Global Terrorism Database at the University of Maryland. Latest threats to U.S. targets include calls by Al-Shabaab for attacks on shopping malls. And a recent intelligence assessment circulated by the Department of Homeland Security focused on the domestic terror threat from right-wing sovereign citizen extremists. On January 12, 2015, President Obama signed into law the Terrorism Risk Insurance Program Reauthorization Act of 2015. A new I.I.I. white paper, Terrorism Risk Insurance Program: Renewed and Restructured, takes us through each of more than eight distinct layers of taxpayer protection provided under TRIA’s renewed structure. 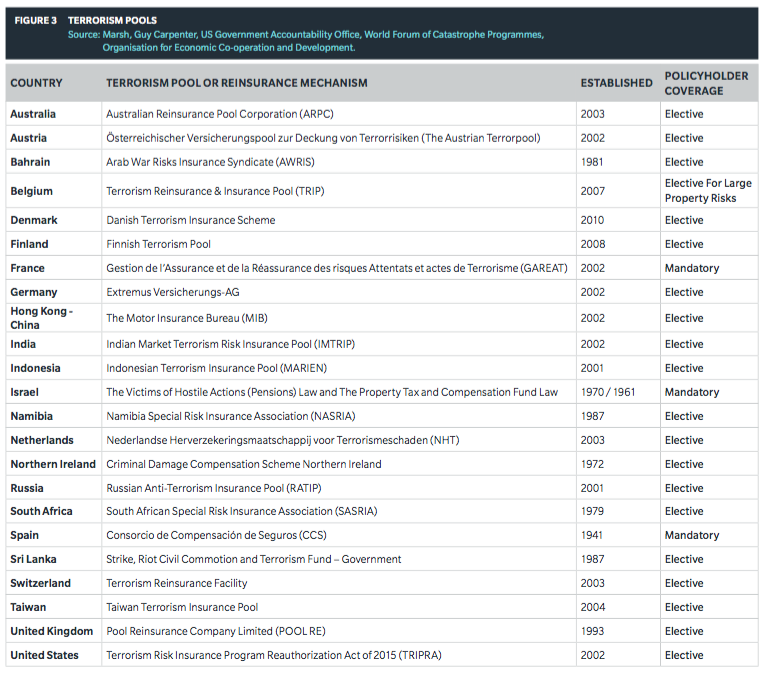 While TRIA from its inception was designed as a terrorism risk sharing mechanism between the public and private sector, an overwhelming share of the risk is borne by private insurers, a share which has increased steadily over time. Today, all but the very largest (and least likely) terrorist attacks would be financed entirely within the private sector. Enactment of the 2015 reauthorization legislation has brought clarity and stability to policyholders and the insurance marketplace once again, the I.I.I. notes. For a federally backed program, that is quite a success story. It’s Election Day and as you head to the polls the insurance issue that remains at the top of mind for most is the future of the Terrorism Risk Insurance Act (TRIA). The private sector simply does not have the capacity to provide insurance or reinsurance for terrorism risk to the extent currently provided by the federal program, the I.I.I. says. As a result, in the absence of the act, terrorism risk insurance would be less available and less affordable. Over at WGA InsureBlog, David Bardelli, senior vice president and casualty practice leader for William Gallagher Associates, notes that with Congress not back in session until mid-November, the clock is ticking for lawmakers to come up with a solution before the end of the year. Insurers are not alone in their concerns over the future of terrorism risk insurance. Just on Friday, the Real Estate Roundtable reported that while senior commercial real estate executives see a continuing recovery in the markets, they remain concerned about the lack of clear direction in many federal policies, primarily terrorism risk insurance. Congress will return November 12 for the “lame duck” session. Allowing the terrorism risk insurance program to expire could increase federal spending by billions of dollars in the event of a future terrorist attack, according to a new study by RAND Corporation. RAND reports that for terrorist attacks with losses up to about $50 billion, not having the Terrorism Risk Insurance Act (TRIA) in place would result in higher federal spending. For terrorist attacks with losses ranging from $14 billion to $26 billion, RAND predicts the federal government would spend $1.5 billion to $7 billion more without TRIA than with the program in place. The greater federal spending without TRIA would result from less insurance coverage, leading to greater uninsured loss and hence greater demand for federal disaster assistance. RAND’sÃ‚ analysisÃ‚ comes as a bipartisan agreement was introduced in the Senate last week that would extend TRIA for seven years, with changes in the insurer co-pay and mandatory recoupment threshold. The study makes the point that the federal government currently makes no net expenditures under TRIA until the commercial insurance industry has paid at least $27.5 billion in claims in TRIA-eligible lines. As the size of the attack increases and the insured loss increases beyond the $27.5 billion industry retention amount, the federal liability through TRIA kicks in. Based on current take-up rates, a 9/11 type attack would result in an insured loss of about $33 billion, RAND notes. Therefore, taxpayers would contribute through TRIA only in an attack comparable in magnitude to 9/11, which remains the second most costly insurance event in U.S. history, exceeded only by Hurricane Katrina. For attacks with greater losses, in excess of $50 billion, the increase in disaster assistance after an attack without TRIA begins to be countered by the elimination of federal payments through the TRIA program, eventually leading to a net decrease in federal spending should TRIA expire. Claims Journal reports on the study findings here.